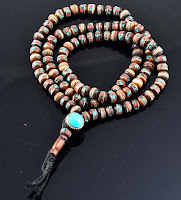 Mandala Trading Blog: Malas, Prayer Beads, Thangkas, Oh My! Malas, Prayer Beads, Thangkas, Oh My! We have almost finished putting everything on the website. Of course, we have tons of products and we will continue to add new products to our website. We carry over 100 Buddhist malas and an amazing line of Tibetan jewelry- and that will take time to put on the site. For now, here are some examples of items in various categories and an explanation of how to navigate our website. We offer a variety of Buddhist prayer beads handmade from a wide range of materials, including shell, coral, turquoise and other gemstones, seed beads like bodhi seeds and lotus seeds, etc. One of my favorite malas in this section is our Medicine Mala, this mala is made from yak bone, coral, turquoise, and the three healing metals. This is an exquisite and popular mala because of its healing properties. The three healing metals are copper, brass, and silver. These three metals are thought to have healing properties when combined. Each category where you will find the item you are looking for is on the left side of the page. If you can't figure out which category the item you are interested in buying is in- use our search bar. Our search bar is great and will quickly find the product you need. A lot of different types of products have been added into our Ritual Items section. This is a great place to go if you are looking for some of the more unusual Buddhist items. One of my favorite items in this category is new to us. It is the Buddhist khata- or Buddhist scarf. This item has been used for many years in Tibet during Buddhist ceremonies, or to pay homage to an important teacher. Tibetan Buddhist Thangka Paintings are images of Buddhas or Mandalas, traditionally mounted on brocade. There is a brocade border around the outside of each of our thangkas. Our thangkas are each 34 inches long and 20 inches wide. We have been selling these thangkas for years, and there are always certain Buddhist deities that people favor over others. 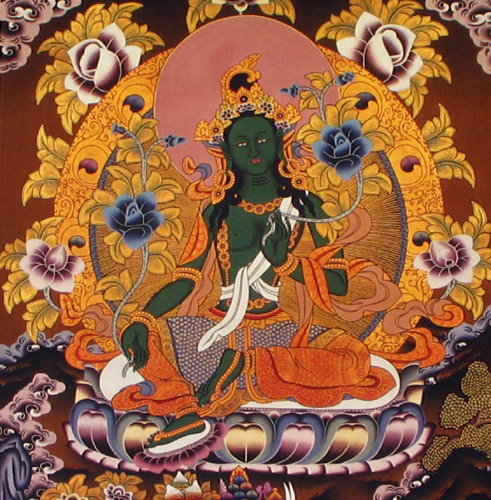 One of our most popular deities is the Green Tara. We carry a few different styles of the Green Tara, and here is one. It is important to us that we are able to carry a unique product line for our customers. If there is an item you are looking for and are unable to find on our site, just let us know and we will be happy to see if we can get it in stock for you.